Getting all hung up trying to decide if a suspension trainer is the right choice for you? Don’t worry, I won’t leave you hanging. 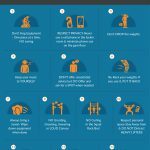 I will give you the info you need to decide for yourself if suspension training is the right equipment for your home gym. 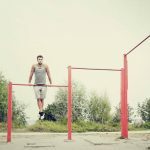 I review the benefits of suspension systems, discuss a few beginner and intermediate exercises to give you an idea of what these systems are capable of, outline the differenced between seemingly similar TRX models, and review 9 of the top suspension training systems. What is Suspension Training? What is TRX? Benefit 2. Suspension trainers and TRX systems work major muscle groups and Stabilizing muscles at the same time. TRX Home vs TRX Pro? TRX Tactical vs Pro vs TRX Go? TRX Suspension Training originated in the US Navy, and has grown in popularity due to its simplicity, portability and the fact that it offers a complete full body workout. 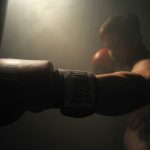 It’s a popular training method utilized by many professional baseball players, military professionals, Olympic athletes, and championship UFC fighters. TRX is an abbreviation for “total body resistance exercise”, which is exactly what TRX suspension training workouts do. Suspension training uses a series of nylon webs or suspension straps with a hook at one end, and hand grips at the other. The hook latches onto a mount, hooks around an anchor like a bar or hooks over a doorway, anchoring the straps. You can use the handles to hold or place your feet in the foot straps to perform the moves outlined in the training. TRX and other suspension trainers use your body weight to exercise. See exercise section below for more details. The suspension system frees you from using a series of workout machines. Instead, TRX and other suspension systems allow you to use your own body weight and the resistance of gravity to perform over 300 highly effective exercises. Due to the nature of using hanging straps during exercise, your core and stabilizing muscles are used to give you balance as you work each major muscle group. You may even see an increase in your flexibility as you master some of the more complicated moves. Obviously, all effective exercise improves your health and helps build muscle. 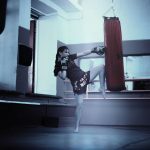 The TRX Suspension Training is a completely different form of fitness training from what you’re used to at the gym and suspension training has its own unique benefits. The following differences make TRX workouts stand out among other workout programs and make TRX Suspension Training a frontrunner in terms of home fitness options. 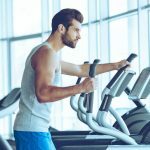 When you’re at the gym, you may be bouncing from machine to machine to workout different muscle groups. Machines at the gym are good for isolation movements, but usually fail with compound movements and targeting stabilizing muscles. You might spend a lot of time in the gym, using free weights, to work all the same muscles you can with the best suspension trainer. Using only one piece of equipment saves time. Plus, you don’t need to drive to the gym to get it done. Suspension trainers are perfect for the home gym. With TRX Suspension Training, you can choose to isolate and build on individual muscles or muscle groups by staying in one position and focusing all of your energy into a limited workout. You will always be using core and stabilizing muscles to maintain position, or move out of position, which is what makes suspension training so well rounded. TRX involves moving around, keeping several muscles engaged at once. TRX and suspension trainers have the variety necessary to target virtually every muscle in your body. This type of workout allows you to hit all muscle groups in one session, or focus on specific muscle groups if you choose-all using the same piece of equipment. No problem. These suspension trainers originated in the Navy and used by sailors in tight quarters. Maybe you just don’t have space for all the gym equipment you would need for a well stocked home gym. And you won’t have to give up your couch to free up space for a treadmill. Suspension trainers allow for cardio and body weight strength training using just one small piece of equipment. One of the biggest perks to TRX is that the system is really small. When you aren’t using it, it’s small enough to stick in a duffle bag and store in the closet or under your bed. Suspension trainers are super portable. If you need to travel, you won’t have to disrupt your workout schedule. The kits weigh anywhere from 2 to 4 lbs and easily fit inside your luggage. You can set it up virtually anywhere. You can set your TRX system up in your hotel room door. Or take it to the park and use it with the monkey bars or a tree. Consider the cost of a gym membership. 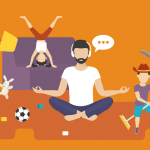 You pay start-up costs, extra fees, and a monthly or annual membership. This can come close to $1,000 per year. If you’re building a complete home gym, that’s a lot more money. 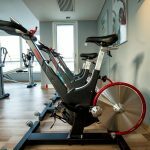 Though home gyms are more economical when you think about how much you’ll save over time, they’re still quite a steep investment. Using a TRX Suspension Training system is one of the least expensive ways to get a workout in at home. Even if you only buy a few pieces of cardio equipment and some basic home gym staples, the TRX is still a huge money saver. For under a couple hundred dollars you have a complete full body workout that you can take with you just about wherever you go. Some pieces of equipment are designed for solely for experienced users. 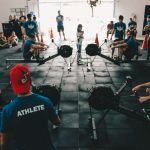 For example, someone who is completely new to fitness may not be able to complete a workout on an intermediate piece of equipment, like a rowing machine or a SkiErg. Since the functions of the TRX suspension training system are so versatile and flexible, anyone of any level of fitness can start with it. A TRX suspension training system is completely human powered. It will work however you use it, and that’s what makes it so great. 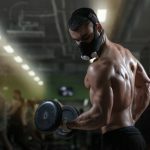 If you’re not yet at a point where you can complete an intense workout or fully commit to certain exercises, you can work at your own level and build up to the harder moves. Start with the easier stuff, increase your reps, and eventually transition into harder workouts. It’s a simple workout you can tailor to you! – You don’t have to worry about hurting yourself by attempting to take on too much, too fast. In order to clear things up, I will call out the special features of each set. Since anyone at any level of fitness can use the TRX, I have separated workouts into two categories: beginner, and advanced. Start at beginner level, and as that gets easier, start to incorporate some advanced exercises. The goal is to slowly transition into solely advanced workouts. As your advanced workout becomes easier, raise your reps or add intensity by limiting your balance to only one arm or one leg. This will turn advanced workouts into expert workouts. A great set of beginner exercises will provide you with an excellent foundation from which to grow. Rowing is great for your core, back, and arms. These are three target zones to develop if you want to advance to the next level. For easy rows, grab the handles of your TRX straps with your palms facing inward and slowly lean back until all of your weight is on the balls of your feet. Go as low as you can while still maintaining your balance, keeping your arms extended as far as you can. Tightening your core and squeezing your shoulders tight, put a bend in your elbow as your raise your torso up to your hands, and lower yourself back down again. Push-ups help build the shoulders and chest. With TRX pushups, you place your feet inside the foot straps. You’ll want your straps a few inches up off the ground, with the strap between your toes and your ankles. With your palms flat on the floor, support your body weight on your hands. Bend your elbows out to lower your body to the floor, and push back up. Lunges are one of the easiest workouts to do, and many people don’t use extra equipment to do them. The handle of your TRX holds your foot in this variant, making the lunge more challenging while putting your balance to the test. With your back to the TRX, double the handles up around your right foot. Put your left foot on the floor. As you bend your knee and bring yourself to the ground, extend your strapped foot further, and come back up. Switch legs and repeat. Inverted rows help you build your lats. You’ll start inverted rows by lying on the floor with your knees up and your feet flat down. Raise your arms all the way up, and grab onto the handles with your palms facing inward. Without moving your elbows away from your sides, bend them until your core is level with your knees. Slowly lower your core back down to the floor. Chest presses target the arms and chest. Rather than lying on the floor, you’re performing the chest press upright using your body weight as resistance. Stand in basic stance, with your feet at shoulder width distance, with your back to the TRX anchor. With an overhand grasp on the strap handles, push your arms out until they’re at shoulder height. Your body should be diagonal. As you bend your elbows, lower your body until it’s between the handles. Push back up. If you’re already physically fit, you may want to start with intermediate workouts. The main challenge is getting used to the configuration of the TRX, which different from other workouts. It’s time to get your obliques in on the action. With your back to the TRX, put your toes into the handles. Put your legs as far apart as you can get them while still maintaining control of your core and a straight back. Perform a regular plank with the upper half of your body, by lifting yourself onto your forearms and holding the position. Hold the position as long as you can, and go back to your starting position. 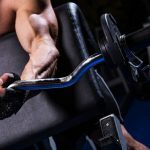 These bicep curls are a lot harder than traditional curls with a dumbbell or a barbell. They really get your abs involved. Facing your TRX, grasp the handles with your palms facing each other. Lean back until your arms are fully extended and the strap is fully stretched. Bend our elbows, keeping them level with your chest, and pull your body up until your hands are near your ears. Go back to the starting position, and pull again. Strengthening your hamstrings is very important when you’ve reached an intermediate level of fitness. Running, jogging, swimming, and any kind of squat lift will require strong hamstrings. If you don’t beef them up, you can injure yourself. Lay flat on the floor with your arms out to your sides. Put your heels into the straps’ handles, and by pressing down with your legs, raise your body until your hips are off the floor. Pull your heels towards your hip as slowly and gently as possible before returning to your starting position. Mountain climbers use almost every muscle in your body, and also provide you with great cardio. It’s one of the single most effective exercises you can do with your TRX. Put your feet in the handles, the same way as if you were about to execute a plank. Rather than doing planks, you’ll be alternating your knees and bringing them up to your chest. Get faster and faster as you go, until you’re found your comfortable top speed. Suspension trainer jump squats will activate nearly every single muscle in your body. It’s intense and it’s effective. Stand with your feet at shoulder width, just like a regular squat. Hold onto the handles with your arms out in front of you. Enter a squat as you reach your arms up, and once you hit the bottom, spring back up and open your arms, throwing them up like a jumping jack. 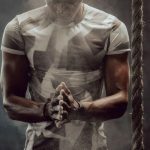 Now that you have seen a glimpse of the vast array of exercises suspension trainers have to offer why not take a look at what the marketplace has available so you can get started training today! These 9 kits allow you to workout and are ready to use on a door or pole right out of the box. Review: TRX travel friendly kit with just the basics and nothing extra to weigh you down on the go. 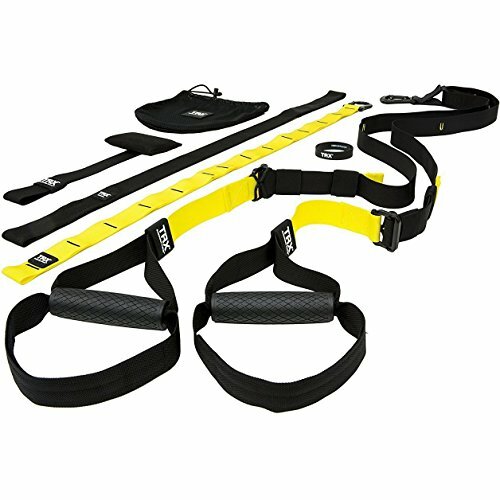 This TRX kit is your budget friendly alternative to other TRX kits. The straps on this Go model are thinner, but they also weigh less and the system is more portable. More light weight and travel friendly. Includes door anchor and extension strap. Includes workout poster and two printed 20 min workouts. Metal clasp/carbineer can scratch doors. 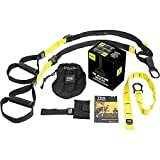 The Lightest and leanest TRX trainer for those on the go. Review: This kit comes with a workout DVD with over an hour of workout instruction, a comprehensive guide to teach users proper forms and the way to execute many of the 300 exercises that can be performed with the TRX system. Includes workout DVD and downloadable digital content codes for the TRX website. Includes a quick start guide/workout manual and carry travel bag. Handles are encased in a dense foam. Basic, but high-quality, sturdy system from TRX. Review: The TRX Training Suspension training Home gym comes with exclusive digital downloads for workout regimens and the handles are constructed from dense foam. If you’re a beginner, this set is perfect. You’re getting the best of the TRX program at an accessible price. Wider straps than less expensive brands. Includes card and code to download digital content from TRX website including 6 workout videos. Includes door anchor and extender strap. You will pay extra for the TRX name. Best suspension trainer for beginners. 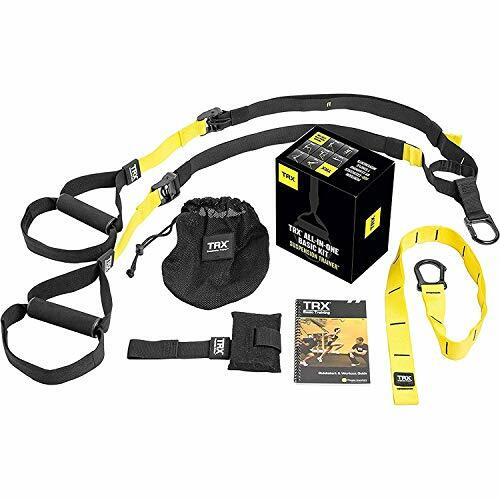 Review: The TRX training pro kit comes with strap extenders and an 8 week workout program. It’s reinforced as strongly as possible and built to industrial standards. The handles are made of a tough rubber, so they’re easier to pull during the most intense workouts. Rubber handles, not foam like many cheaper models. Kit includes door anchor and extender strap. Pricy because it is the brand name. 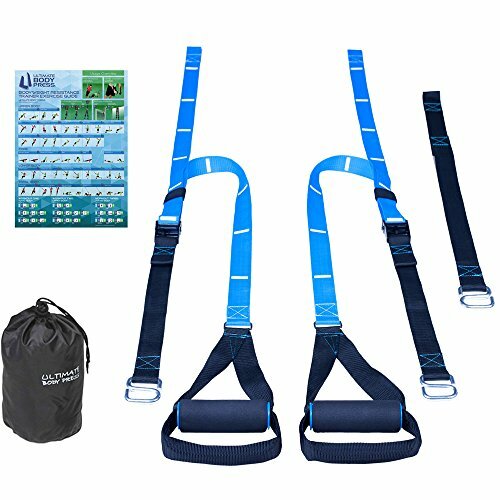 Best suspension training straps because quality is high and rubber handles outperform other foam types. Review: The tactical gym is essentially the same as the Pro Suspension Training Kit, but it’s made to military standards. The workouts that come with this kit are inspired by boot camp workouts used by real military staff. This set is completely weatherproofed, making it perfect for setting up outside. Includes code for TRX Force Super Smartphone App puts a 12 week, scientifically backed and field tested workout program at your fingertips. The tactical edition is made of more heavy duty material than the standard TRX systems. Rubber hand grips, not foam like most others. Includes printed guide book and workout poster. Best suspension training equipment built to tactical standards. 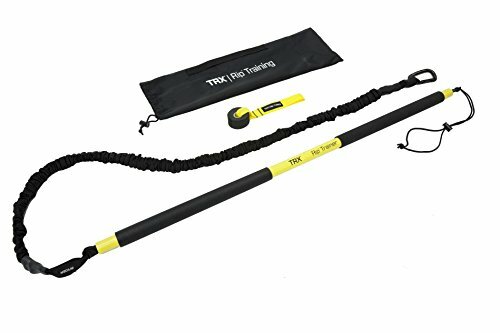 Review: This Unique TRX Rip trainer sets itself apart from other TRX systems and suspension trainers because it is designed to develop speed, strength and rotational power for a full body workout. 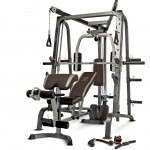 The system is composed of a rip trainer, which is a firm rod with a resistance bungee attached to the end. The Resistance cord can be attached to a door, pole, tree, or even on the other end of the rip trainer depending on exercise. Kit includes downloadable 20 min video demonstrating all the Rip Trainer has to offer. Set includes door anchor, Rip Trainer, Med resistance bungee and carry bag. The only suspension trainer focused solely on rotational power. Previously the set included a DVD, but no longer does. There are however, many YouTube videos available for this trainer. Best suspension trainer for rotational strength. 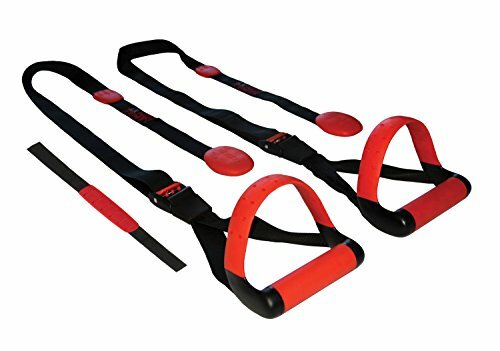 Review: This simple, affordably priced bodyweight resistance trainer suspension system is a versatile piece of equipment that allows you to get a great workout just about anywhere. The set includes an S hook and can be used on any bar or door. Plus, each strap hangs independently in this dual anchor system, which means you control how far apart the straps are from each other, or you can choose to mount fro a single anchor point similar to a single anchor system like TRX systems. Dual anchor system, each strap hangs independently or choose to hang from a single anchor point. All equipment needed to mount to a door or bar included. Would be better if S hook was rubber coated so as not to scratch doors. 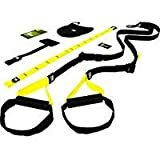 Popular and affordable alternative to the more expensive TRX system. My choice for best suspension trainer for the money. Review: The Lifeline Jungle Gym XT is a very well build suspension training system. The best features are the extra wide industrial grade straps, the built in door hangars for super easy set up and maximum portability, and the rigid foot strap that allows you to slip your foot in quickly and easily. Try that with other systems that have a soft foot strap and you will immediately see why a firm foot is better. Firm foot cradle, not soft or flimsy. Easy to get into and out of. System is designed with two separate straps so you control width between straps (aka Dual anchor system). These extra wide straps have built in door anchors. Strap ends dangle after you adjust them. 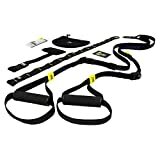 This system is the best built system of all the suspension training straps reviews in this list. Review: Sometimes it’s good to be a little unbalanced. The CrossCore Rotational system works your core muscles by challenging your balance and forcing you to use stabilizing muscles to stay stable. 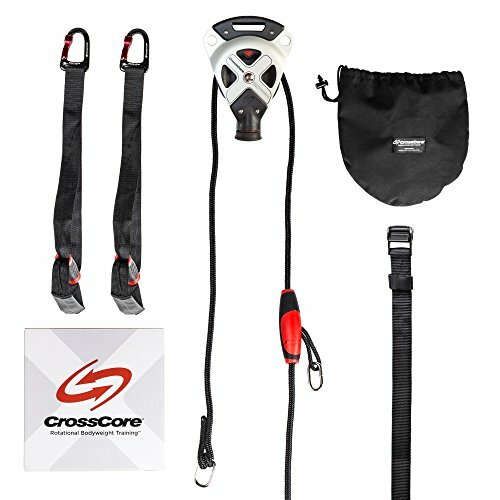 At the heart of the CrossCore system is a patented pulley system which makes this suspension training system different from every other one out there. Aluminum alloy pulley system with sealed bearings. Can be used in locked position for moves done in a stable position. Can be used as a counterweight system, with a weigh on one side, and you pulling on the other. High quality, mountain climbing cable. Door kit not included in this set, must order separately. More than just a Suspension trainer, the pulley system opens up a whole new set of training options. Easily one of the best suspension trainers 2019. You’ll never outgrow a suspension training system and they are the perfect solution while traveling making them a wise investment. I would love to hear what you think. How are you using your TRX or other Suspension training system? Where is your favorite place to set it up? Drop me a line in the comments below, I would love to hear from you!